Everybody in Texas politics seems to be messing with each other. Former Gov. 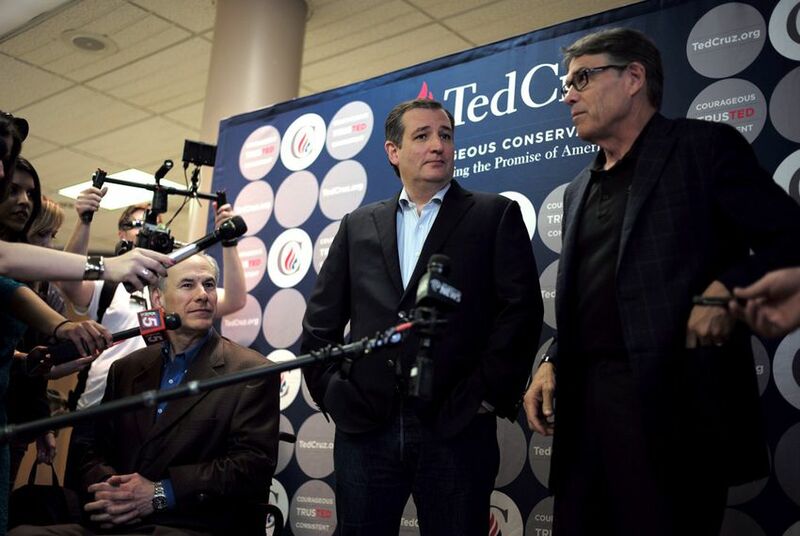 Rick Perry encouraged U.S. Rep. Michael McCaul to run against Ted Cruz, according to sources who talked to the Trib’s Abby Livingston and Patrick Svitek. Lt. Gov. Dan Patrick suggested a special session on public school finance, only to be shushed by Gov. Greg Abbott, who said the Legislature has “plenty of time” to address big issues. That session starts in January. Sounds like it’s going to be a lot of fun. Don’t get too upset with these folks — the political professionals, especially the Republicans, are getting mixed signals from their voters. The noise at the top reflects the noise in the ranks and the complexity of the problems the state is wrestling. Patrick’s point, he said later, wasn’t that he wants a special session of the Legislature, but that he thinks it will take one to cook up a solution to the perennial gnarly problem of paying for public education in the state. The Texas Supreme Court ruled this year that the current setup is constitutional, but also said in any number of ways that it’s a real mess. State funding per student has dropped over the last decade. Local school property taxes have risen because of that shifting load and because property values in parts of the state have risen rapidly. The state also has to make sure that students have access to decent education no matter what part of the state they’re in and no matter what the local economic situation is. Typically, the courts force the Legislature’s hand, forcing it to choose between state tax increases, local property tax increases and cuts in school spending. With a court ruling to strengthen their spines, the politicians have been able to sell voters on a solution — usually a combination of higher state spending, temporarily lower property taxes, and a higher, more balanced level of spending. Nothing is forcing their hand now, and some — Patrick among them, apparently — think it would take the focus and pressure of a special session to squeeze a finance plan out of lawmakers. Patrick is also stirring on other fronts, telling businesses and others that he intends to push for regulation of which public facilities — restrooms, locker rooms and the like — transgender people can use. That gets mixed reviews from most Texas voters, but the Republicans — Patrick’s base — are clearly on his side, according to the latest University of Texas/Texas Tribune Poll. Republican voters have taken sides; Democratic opinions remain too fuzzy to send that party’s lawmakers a clear signal. At the same time, the issue has raised objections from business and sporting interests in other states and could run into opposition when the Texas Legislature takes it up next year. That puts some Republicans in a bind, with voters on one side and otherwise friendly businesses on the other. The other squabble in the headlines is a pure piece of politics, but it opened an argument that revealed some differences within the conservative ranks. Perry and Cruz both ran for president. Perry was out before the voting started. Cruz was the second-to-last competitor to Donald Trump to get out of the race (John Kasich of Ohio was the last one). Cruz’s final marks on the race were less than spectacular. He spoke at the GOP’s national convention but declined to endorse Trump, angering Republicans who wanted to pull the party together behind a nominee and then move forward to try to beat Hillary Clinton. Cruz, having said his position was a matter of conscience and personal honor, reconsidered and finally endorsed Trump last month. But that was right before the salacious recording of Trump and Billy Bush of Access Hollywood was made public — a revelation that shocked some Republicans away from Trump and made Cruz’s change of heart seem ill-considered. At the same time, McCaul, an Austin Republican who is the second-wealthiest member of Congress, acknowledged he was being encouraged to take a look at the U.S. Senate, what with Cruz coming up for re-election in 2018. When Perry was outed as one of those encouragers, conservatives who view McCaul as a moderate leapt to Cruz’s defense. McCaul didn’t jump into the latest fight, but said last week that the state needs someone in the Senate who doesn’t have his or her eye on their next perch. "I think he's spent a lot of time since Day One running for president," McCaul said of Cruz. "I think we deserve somebody in the Senate who is going to be representing the interests of the state of Texas." Republicans in the latest UT/TT Poll seem solidly behind Cruz, to a point: They weren’t asked whether they would prefer him or someone else in the next Senate race, but 63 percent said they have a favorable opinion of their junior senator. On the other hand, 81 percent of Democrats have an unfavorable view of Cruz, which explains some of the political stirrings on their end of the woods. Wonder why your elected officials seem so confused? Look in the mirror, Texas.